"Lady Bug" redirects here. For other uses, see Lady Bug (disambiguation). 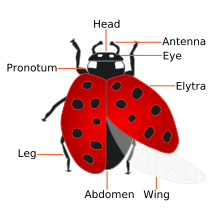 "Ladybird", "Ladybug", and "Lady beetle" redirect here. For other uses, see Ladybird (disambiguation). Coccinellidae (/ˌkɒksɪˈnɛlɪdiː/) is a widespread family of small beetles ranging in size from 0.8 to 18 mm (0.03 to 0.71 inches). The family is commonly known as ladybugs in North America, and ladybirds in Britain and other parts of the English-speaking world. Entomologists widely prefer the names ladybird beetles or lady beetles as these insects are not classified as true bugs. The majority of coccinellid species are generally considered useful insects, because many species prey on herbivorous homopterans such as aphids or scale insects, which are agricultural pests. Many coccinellids lay their eggs directly in aphid and scale insect colonies in order to ensure their larvae have an immediate food source. However, some species do have unwelcome effects; among these, the most prominent are of the subfamily Epilachninae (which includes the Mexican bean beetle), which are herbivorous themselves. Usually, epilachnines are only minor agricultural pests, eating the leaves of grain, potatoes, beans, and various other crops, but their numbers can increase explosively in years when their natural enemies, such as parasitoid wasps that attack their eggs, are few. In such situations, they can do major crop damage. They occur in practically all the major crop-producing regions of temperate and tropical countries. The name coccinellids is derived from the Latin word coccineus meaning "scarlet". The name "ladybird" originated in Britain where the insects became known as "Our Lady's bird" or the Lady beetle. Mary (Our Lady) was often depicted wearing a red cloak in early paintings, and the spots of the seven-spot ladybird (the most common in Europe) were said to symbolise her seven joys and seven sorrows. In the United States, the name was adapted to "ladybug". Common names in some other European languages have the same association, for example, the German name Marienkäfer translates to Marybeetle. Coccinellids are often conspicuously coloured yellow, orange, or red with small black spots on their wing covers, with black legs, heads and antennae. There is, however, great variation in these colour patterns. For example, a minority of species, such as Vibidia duodecimguttata, a twelve-spotted species, have whitish spots on a brown background. Coccinellids are found worldwide, with over 6,000 species described. Most coccinellids have round to elliptical, dome-shaped bodies with six short legs. Depending on the species, they can have spots, stripes, or no markings at all. Seven-spotted coccinellids are red or orange with three spots on each side and one in the middle; they have a black head with white patches on each side. As well as the usual yellow and deep red colourings, many coccinellid species are mostly, or entirely, black, dark grey, gray, or brown, and may be difficult for non-entomologists to recognise as coccinellids at all. Conversely, non-entomologists might easily mistake many other small beetles for coccinellids. For example, the tortoise beetles, like the ladybird beetles, look similar because they are shaped so that they can cling to a flat surface so closely that ants and many other enemies cannot grip them. Non-entomologists are prone to misidentify a wide variety of beetle species in other families as "ladybirds", i.e. coccinellids. Beetles are particularly prone to such misidentification if they are spotted in red, orange or yellow and black. Examples include the much larger scarabaeid grapevine beetles and spotted species of the Chrysomelidae, Melyridae and others. Conversely, laymen may fail to identify unmarked species of Coccinellidae as "ladybirds". Other beetles that have a defensive hemispherical shape, like that of the Coccinellidae (for example the Cassidinae), also are often taken for ladybirds. A common myth, totally unfounded, is that the number of spots on the insect's back indicates its age. In fact, the underlying pattern and colouration are determined by the species and genetics of the beetle, and develop as the insect matures. In some species its appearance is fixed by the time it emerges from its pupa, though in most it may take some days for the colour of the adult beetle to mature and stabilise. Generally, the mature colour tends to be fuller and darker than the colour of the callow. Paraplectana tsushimensis is an Asian spider that mimics ladybirds. Brumoides suturalis is longitudinally striped. Unusually for a Coccinellid, the mature Rhyzobius chrysomeloides is brown and unspotted. Coccinella transversalis, elytra in the open position. In this coccinellid, the black spots are so large they meet. A specimen of Harmonia axyridis in South Africa, freshly out of its pupa. Its black spots will develop as its exoskeleton hardens. Henosepilachna guttatopustulata, a herbivore and one of the largest ladybirds, feeding on a potato leaf. This species is multicoloured. This yellow-shouldered ladybird (Apolinus lividigaster) feeding on an aphid has only two colour spots. Some species have none. A yellow, twenty-two spot ladybird (Psyllobora vigintiduopunctata). Apart from the generalist aphid and scale predators and incidental substances of botanical origin, many Coccinellidae do favour or even specialise in certain prey types. This makes some of them particularly valuable as agents in biological control programmes. Determination of specialisation need not be a trivial matter, though; for example the larva of the Vedalia ladybird Rodolia cardinalis is a specialist predator on a few species of Monophlebidae, in particular Icerya purchasi, which is the most notorious of the cottony cushion scale species. However, the adult R. cardinalis can subsist for some months on a wider range of insects plus some nectar. Certain species of coccinellids are thought to lay extra infertile eggs with the fertile eggs, apparently to provide a backup food source for the larvae when they hatch. The ratio of infertile to fertile eggs increases with scarcity of food at the time of egg laying. Such a strategy amounts to the production of trophic eggs. Some species in the subfamily Epilachninae are herbivores, and can be very destructive agricultural pests (e.g., the Mexican bean beetle). Again, in the subfamily Coccinellinae, members of the tribe Halyziini and the genus Tythaspis are mycophagous. While predatory species are often used as biological control agents, introduced species of coccinellids are not necessarily benign. 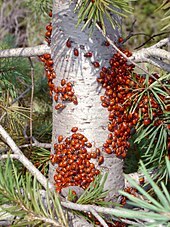 Species such as Harmonia axyridis or Coccinella septempunctata in North America outcompete and displace native coccinellids and become pests themselves. The main predators of coccinellids are usually birds, but they are also the prey of frogs, wasps, spiders, and dragonflies. The bright colours of many coccinellids discourage some potential predators from making a meal of them. This phenomenon, called aposematism, works because predators learn by experience to associate certain prey phenotypes with a bad taste. A further defence, known as "reflex bleeding", exists in which an alkaloid toxin is exuded through the joints of the exoskeleton, triggered by mechanical stimulation (such as by predator attack) in both larval and adult beetles, deterring feeding. Coccinellids in temperate regions enter diapause during the winter, so they often are among the first insects to appear in the spring. Some species (e.g., Hippodamia convergens) gather into groups and move to higher elevations, such as a mountain, to enter diapause. Most coccinellids overwinter as adults, aggregating on the south sides of large objects such as trees or houses during the winter months, dispersing in response to increasing day length in the spring. Predatory coccinellids are usually found on plants which harbour their prey. They lay their eggs near their prey, to increase the likelihood the larvae will find the prey easily. In Harmonia axyridis, eggs hatch in three to four days from clutches numbering from a few to several dozen. 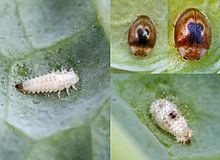 Depending on resource availability, the larvae pass through four instars over 10–14 days, after which pupation occurs. After a teneral period of several days, the adults become reproductively active and are able to reproduce again later, although they may become reproductively quiescent if eclosing late in the season. Total life span is one to two years on average. The atlas Ladybirds (Coccinellidae) of Britain and Ireland published in 2011 showed a decline of more than 20% in native species due to environmental changes and competition from foreign invaders. The distribution maps, compiled over a 20-year period with help from thousands of volunteers, showed a decline in the numbers of the common 10-spot and 14-spot ladybirds and a number of other species, including the 11-spot, 22-spot, cream-spot, water and hieroglyphic ladybirds, Coccidula rufa, Rhyzobius litura and Nephus redtenbacheri. Conversely, increases were seen in the numbers of harlequin, orange, pine, and 24-spot ladybirds, as well as Rhyzobius chrysomeloides. The kidney spot ladybird was recorded in Scotland for the first time in recent years, and the 13-spot was found to have recolonised Cornwall, Devon, and the New Forest. The most commonly recorded species was the 7-spot, closely followed by the Asian harlequin — an invader that arrived from continental Europe in 2003 after being introduced to control pests. An 'explosion' in the number of orange ladybirds, which feed on mildew, is thought to have been due to the warmer, damper conditions that now prevail in parts of England. In the United States, coccinellids usually begin to appear indoors in the autumn when they leave their summer feeding sites in fields, forests, and yards and search out places to spend the winter. Typically, when temperatures warm to the mid-60s F (around 18 °C) in the late afternoon, following a period of cooler weather, they will swarm onto or into buildings illuminated by the sun. Swarms of coccinellids fly to buildings in September through November depending on location and weather conditions. Homes or other buildings near fields or woods are particularly prone to infestation. After an abnormally long period of hot, dry weather in the summer of 1976 in the UK, a marked increase in the aphid population was followed by a "plague" of ladybirds, with many reports of people being bitten as the supply of aphids dwindled. The presence of coccinellids in grape harvests can cause ladybird taint in wines produced from the grapes. Harmonia axyridis (the harlequin ladybird) is an example of how an animal might be partly welcome and partly harmful. It was introduced into North America from Asia in 1916 to control aphids, but is now the most common species, outcompeting many of the native species. It has since spread to much of western Europe, reaching the UK in 2004. It has become something of a domestic and agricultural pest in some regions, and gives cause for ecological concern. It has similarly arrived in parts of Africa, where it has proved variously unwelcome, perhaps most prominently in vine-related crops. 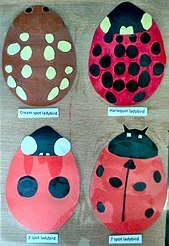 Ladybirds have long been of interest to children. They had many regional names (now mostly disused) in English, such as variations on Bishop-Barnaby (Norfolk and Suffolk dialect) – Barnabee, Burnabee, the Bishop-that-burneth, and bishy bishy barnabee. The etymology is unclear, but it may be from St. Barnabas' feast in June, when the insect appears, or a corruption of "Bishop-that-burneth", from the fiery elytra of the beetles. This poem has its counterpart in German as Marienwürmchen, collected in Des Knaben Wunderhorn, and set to music by Robert Schumann as Op. 79, No. 13, and a Polish nursery rhyme, "Little Ladybirds' Anthem", of which a part ("fly to the sky, little ladybird, bring me a piece of bread") became a saying. Many cultures consider ladybirds lucky and have nursery rhymes or local names for the insects that reflect this. For instance, the Turkish name for the insect is uğur böceği, literally meaning "good luck bug". In many countries, including Russia, Turkey, and Italy, the sight of a coccinellid is either a call to make a wish or a sign that a wish will soon be granted. In Christian areas, they are often associated with the Virgin Mary and the name that the insect bears in the various languages of Europe corresponds to this. Although historically many European languages referenced Freyja, the fertility goddess of Norse mythology, in the names, the Virgin Mary has now largely supplanted her, so that, for example, freyjuhœna (Old Norse) and Frouehenge have been changed into marihøne (Norwegian) and Marienkäfer (German), which corresponds with Our Lady's bird. Sometimes, the insect is referred to as belonging directly to God (Irish bóín Dé, Polish boża krówka, Russian божья коровка (bozhya korovka), all meaning "God's [little] cow"). In Dutch it is called lieveheersbeestje, meaning "little animal of our Good Lord". In both Hebrew and Yiddish, it is called "Moshe Rabbenu's (i.e. Moses's) little cow" or "little horse", apparently an adaptation from Slavic languages. Occasionally, it is called "little Messiah". The insects have been used to symbolise Ladybird Books (part of Penguin Group), the Ladybird range of children's clothing sold by the former high street chain Woolworth's in the UK, while the ladybird street tile is a symbol against senseless violence in the Netherlands, and is often placed on the sites of deadly crimes. Ladybirds have served as the US state insects of Delaware, Massachusetts, New Hampshire, New York, Ohio, and Tennessee, though only New York has selected a species native to the United States (Coccinella novemnotata); the other states have all adopted an invasive European species (Coccinella septempunctata). They have also been adopted as the mascot of Candanchú, a ski resort near Canfranc in the Spanish Pyrenees. ^ a b "Coccinellidae Latreille, 1807". Integrated Taxonomic Information System. Retrieved 24 July 2012. ^ "Wikispecies: Microweiseinae". 2012. Retrieved 9 March 2013. ^ Seago, A. E.; Giorgi, J. A.; Li, J.; Ślipińskia, A. (July 2011). "Phylogeny, classification and evolution of ladybird beetles (Coleoptera: Coccinellidae) based on simultaneous analysis of molecular and morphological data". Molecular Phylogenetics and Evolution. 60 (1): 137–151. doi:10.1016/j.ympev.2011.03.015. PMID 21426943. ^ White, R.E. 1983. A field guide to the beetles of North America. Peterson Field Guide Series #29. ^ Society, National Geographic. "Ladybugs, Ladybug Pictures, Ladybug Facts – National Geographic". Retrieved October 4, 2016. ^ Brown, L., ed. (2007). The Shorter Oxford English Dictionary. 1 (6 ed.). p. 441. ^ a b Anonymous. "Why are ladybirds so-called?". UK Ladybird survey. Retrieved 15 October 2010. ^ Samaha, John M. "Marian Roots of the Name". Our Lady's Bug. Dayton, Ohio: International Marian Research Institute. Retrieved 15 October 2010. ^ Roy, Helen E.; Brown, Peter M.J.; et al. (15 April 2013). Ladybirds (2nd ed.). Pelagic publishing. p. 142. ISBN 9781907807077. ^ Anonymous. "common name: ladybirds, ladybird beetles, lady beetles, ladybugs (of Florida)". Featured creatures. University of Florida. Retrieved 8 April 2010. ^ Seago, Ainsley E.; Giorgi, Jose Adriano; Li, Jiahui; Slipinski, Adam (15 March 2011). "Phylogeny, classification and evolution of ladybird beetles (Coleoptera: Coccinellidae) based on simultaneous analysis of molecular and morphological data" (PDF). Molecular Phylogenetics and Evolution. 60: 137–151. doi:10.1016/j.ympev.2011.03.015. PMID 21426943. Retrieved 14 February 2016. ^ "Everything Ladybug! The source for Ladybug Stuff!". Everything-ladybug.com. Retrieved 22 June 2010. ^ Anonymous. "Ladybird spotters". UK Ladybird survey. Retrieved 17 June 2010. ^ "European corn borer - Ostrinia nubilalis (Hubner)". entnemdept.ufl.edu. Retrieved 13 November 2017. ^ "The European Corn Borer". www.ent.iastate.edu. Retrieved 13 November 2017. ^ Smart, John (1963). British Museum (Natural History) Instructions for Collectors NO. 4A. Insects. London: Trustees of the British Museum. ^ Sands, D. P. A. and R. G. Van Driesche. 2000. Evaluating host specificity of agents for biological control of arthropods: rationale, methodology and interpretation, pp. 69-83. In Van Driesche, R. G., T. A. Heard, A. S. McClay, and R. Reardon (eds.). Proceedings of Session: Host Specificity Testing of Exotic Arthropod Biological Control Agents: The Biological Basis for Improvement in Safety. Xth International Symposium on Biological Control of Weeds. 4–14 July 1999. Bozeman, Montana. U.S.D.A. Forest Service Bulletin FHTET-99-1, Morgantown, West Virginia, U.S.A.
^ J. Perry & B. Roitberg (2005). "Ladybird mothers mitigate offspring starvation risk by laying trophic eggs". Behavioral Ecology and Sociobiology. 58 (6): 578–586. doi:10.1007/s00265-005-0947-1. ^ "TrekNature – LADY BEETLES Photo". ^ A. Honek, Z. Martinkova & S. Pekar (2007). "Aggregation characteristics of three species of Coccinellidae (Coleoptera) at hibernation sites" (PDF). European Journal of Entomology. 104 (1): 51–56. doi:10.14411/eje.2007.008. ^ "What Is the Life Span of a Ladybug?". Sciencing. Retrieved 24 December 2017. ^ Roy, Helen; Peter Brown; Robert Frost; Remy Poland (15 June 2011). Ladybirds (Coccinellidae) of Britain and Ireland. The Field Studies Council. p. 204. ISBN 978-1-906698-20-1. ^ Sample, Ian (15 June 2011). "Spot check finds Britain's native ladybirds struggling to compete with alien invaders". The Guardian. Guardian Newspapers ltd. p. 3. Retrieved 17 June 2011. ^ Anonymous (5 July 2001). "Phew, what a scorcher!". The Northern Echo. Archived from the original on 4 July 2009. Retrieved 8 April 2010. ^ Wainwright, Martin (17 May 2006). "The great drought". London: The Guardian. Retrieved 8 April 2010. ^ Easton, Sally (2 February 2012). "Ladybird contamination on the rise". The Drinks Business. Union Press Ltd. Retrieved 21 June 2013. ^ a b Anonymous (5 October 2004). "'Deadly ladybird' sighted in UK". BBC News. Retrieved 17 June 2010. ^ Anonymous. "The Harlequin Ladybird has landed!". The Harlequin ladybird survey. Retrieved 17 June 2010. ^ "Invasive Species South Africa - Protecting Biodiversity from Invasion - Harlequin ladybird citizen science project". Retrieved 24 December 2017. ^ Timmins, Nicholas (14 October 1994). "The Tories in Bournemouth: Teachers promised support as Shephard calls truce". The Independent. London. ^ Edward Moor (1823). Suffolk Words and Phrases: Or, An Attempt to Collect the Lingual Localisms of that County. J. Loder. pp. 33–. ^ Lewie C. Roache (1960) Ladybug, Ladybug: What's in a Name? The Coleopterists Bulletin 14(1):21-25. ^ Szkolnastrona.pl. "szkolnastrona – Przedszkole Publiczne im. Jana Brzechwy w Małomicach – Nasze grupy – BIEDRONECZKI – 4 LATKI -". ^ "Bishop Barnaby". Notes and Queries. 9. 29 December 1849. ^ Born to Kvetch, Michael Wex, St. Martin's Press, New York, 2005, ISBN 0-312-30741-1. ^ Gani, Aisha (12 October 2015). "Ladybird books introduce Peter and Jane to hipsters and hangovers" – via www.theguardian.com. ^ Seaton, Paul. "Ladybird Clothing - a history of Pasolds". www.woolworthsmuseum.co.uk. ^ Anonymous (April 2004). "Speech by Mrs Maud de Boer-Buquicchio on the occasion of the placement of a ladybird tile at the Council of Europe". Council of Europe. Retrieved 21 September 2011. ^ "TITLE 29 - CHAPTER 3. STATE SEAL, SONG AND SYMBOLS - Part . [REFER TO THE BOOK FOR THE PROPER TABLE]". delcode.delaware.gov. ^ www.staffmedia.com, StaffMedia Branding Design S.L. ->. "Estación de Esquí de Candanchú – Ven a esquiar en Familia". Retrieved 15 September 2016. Look up ladybird in Wiktionary, the free dictionary. Wikimedia Commons has media related to Coccinellidae. Nedvěd O., Kovář I., 2012: Appendix: List of genera in tribes and subfamilies. In: Hodek I., Honěk A., van Emden H.F. (2012) Ecology and Behaviour of the Ladybird Beetles (Coccinellidae). John Wiley and Sons Ltd. pp. 526–531. Ladybird beetles of Florida on the UF / IFAS Featured Creatures website. Ladybird beetles – recent immigrants to Florida on the UF / IFAS Featured Creatures website. Camila Domonoske (May 20, 2017). "Scientists Sneak A Peek At How Ladybugs Fold Their Wings". NPR.